Will The Federal Reserve Send The Market Higher? 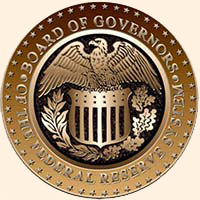 The Federal Reserve Open Markets Committee (FOMC) begins its deliberations today, which will be followed tomorrow, September 20, by a meeting statement, a summary of projections, and a press conference by the Chair. 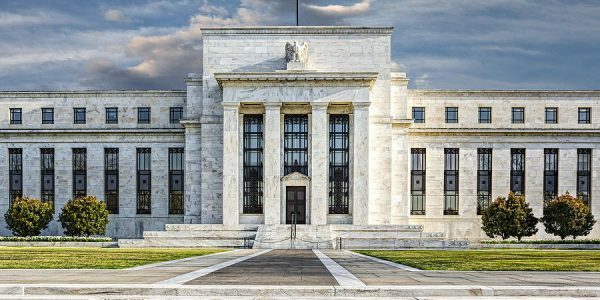 This Federal Reserve meeting would be stepping out of the ho-hum character that recent meetings have acquired, as the Federal Reserve policy begins to acquire an aggressive edge. The central bank is expected to announce the timing to initiate the quantitative de-easing or balance sheet normalization program for its $3+ trillion bond portfolio that was built-up in response to the 2008 financial crisis. Most likely, the expectation is for this program to begin on October 1 and follow the wind-down path laid out in an earlier meeting. The key question now remains whether the Federal Reserve will follow-through on its final interest rate increase for the year in December. The question assumes great importance, for a December interest rate increase will be too close to the initiation of a balance sheet rollback, expected to begin October 1, and can run the risk of over-tightening in a short span of time. "The question is will the Federal Reserve's tightening on two fronts - monetary policy and money supply - begin to plant the seeds of a slowdown?" Monetary Policy along with Earnings and Economy are three key determinants for market valuation. All three have been supportive of the stock market, creating a Goldilocks situation which has allowed the market to remain resilient - in spite of growing predictions for a deep correction and bear market fears from leading money managers, as pointed in our past articles. However, a sharpening of the monetary policy elevates the risk of a US economic slowdown, thus beginning to change the supportive framework for the stock market and deviate from the synchronized global growth that has sent stocks higher. Consequently, the level of flexibility that the Federal Reserve demonstrates on Wednesday, through its official comments, and in the press briefing, that its projected final interest rate increase this year is not baked-in, can determine how favorably the stock market responds. Note that the decision on the last interest rate increase for the year will not be clear until the December 12-13 meeting. 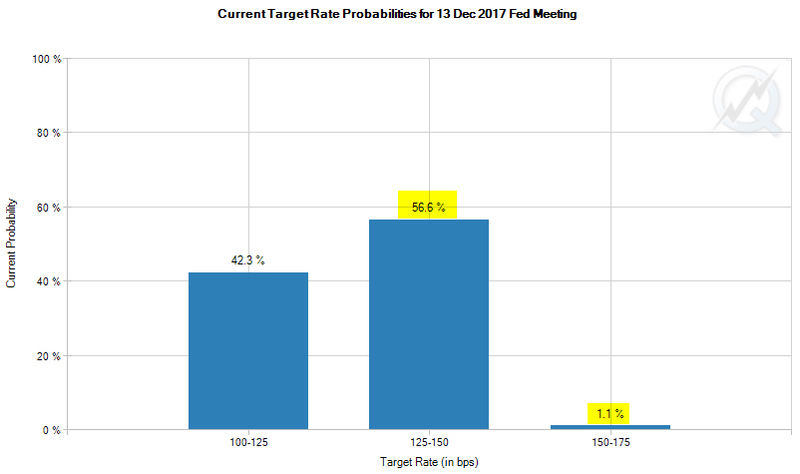 At present, the chance of a December rate increase, based on interest rate futures, is placed at 58%, up from 53% a week ago and 41% a month ago. Recall that the present Federal Funds interest rate band is at 100-125 basis points. It seems more members of the 9-member voting committee are inclined to be driven by improvement in inflation metrics, instead of raising rates and expecting inflation to improve towards the 2% target in the future. These include Governors Lael Brainard, Neel Kashkari (Minneapolis), Charles Evans (Chicago), and Robert Kaplan (Dallas). In fact, Governor Neel Kashkari even mused recently that the current pace of interest rate increases has been aggressive and the economy is already beginning to pay a cost. It is his belief that the Federal Reserve is "overestimating how tight the labor market is," which can contribute towards explaining the low inflation and low wage growth. Less than robust economic reports for August on nonfarm payrolls, retail sales, and inflation, lend credence to Governor Kashkari's reasoning and the overall argument for a more patient interest rate policy. Many of the arguments for raising interest rates hinge upon the typical Phillips Curve, created by economist A. W. Phillips, which quantifies the inverse relationship that exists between an economy's unemployment rate and the commensurate rise in inflation through wage growth. So simply put, low unemployment translates into high inflation and vice-versa. There is a wave of deflationary forces that continue to be unleashed as a result of improving economic efficiency. Just ask Target (TGT), Costco (COST), Best Buy (BBY), Kroger (KR) and Walmart (WMT) how they are competing in a world of Amazon (AMZN), Google (GOOGL), and Facebook (FB). The famed Toys R'Us retail store chain filed for bankruptcy today in this new environment that is severely punishing for traditional retailers that fail to adapt. Technology is undermining the typical relationship of a low unemployment rate leading to inflation and appears to have meaningfully depressed the inflection point at which wage inflation may respond forcefully to low unemployment. Perhaps it is The Great Recession that has unhinged past relationships and recast traditional inflection points. How robust is the Phillips Curve relationship between Unemployment and Inflation? In an analysis done last year, in the post-Great Recession era, economist Olivier Blanchard reestimated the Phillips Curve and discovered that the relationship between unemployment and inflation has lost its steepness and is much flatter today. In a posting 3 weeks ago, Federal Reserve Bank of St. Louis President James Bullard took the estimates of Blanchard to come up with the possibilities of inflation for different unemployment rate scenarios, which are presented below. Reviewing the data, there appears to be significant room for Unemployment to still drop without spiking inflation. For every 50 basis point decline in the unemployment rate, there is a commensurate 10 basis point rise in the inflation rate. A declining unemployment rate no longer appears to provoke inflation to the same degree as in the past. At the same time, inflation expectations, which play a key role in economic behavior, remain well-anchored amongst businesses and consumers. Based on this outlook, the Federal Reserve should not feel chained by past norms to pursue a rising interest rate policy in a new paradigm where unemployment rate and inflation linkage has weakened considerably. There continues to be room for strategic patience. Even though stocks have entered into a period of near-term elevated risk due to developments on the monetary policy front, and uncertain fiscal policy, the overall picture beyond near-term remains in favor of stocks, as discussed in the article, Partial Eclipse Maybe, But Not A Total One. Any suggestion of an open-minded approach towards the next rate increase, which brings down the probability of a hike in December, will be considered accommodative and favorable to the stock market. Amongst the many promising sectors, we believe Biotech stocks present a strong case for a higher portfolio allocation, and should continue to do well for the remainder of the year. The recent revival of another attempt to repeal the Affordable Care Act adds uncertainty till the end of September. But we believe Biotechs remains favorably poised and ready for further gains as discussed in the Biotech Bonanza article. At this time we remain fully invested in our Prudent Biotech Portfolio, which is up +22% as of the end of August, and less than fully invested in our Graycell Small Cap Portfolio, which is up +36%. At this time we remain fully invested in our Prudent Biotech Portfolio, which is up +22% as of the end of August, and less than fully invested in our Graycell Small Cap Portfolio, which is up +36%. Some of the promising biotech and small-cap companies that can be considered for a portfolio include Celgene (NASDAQ:CELG), Exelixis (EXEL), Puma Biotechnology (PBYI), Acadia Pharmaceuticals (ACAD), Bluebird (NASDAQ:BLUE), Aerie Pharmaceuticals (NASDAQ:AERI), Novocure (NASDAQ:NVCR), Foundation Medicine (NASDAQ:FMI), Exact Sciences (NASDAQ:EXAS), Dynavax (DVAX), Amicus Therapeutics (FOLD), Arena Pharmaceuticals (ARNA), Myokardia (MYOK), Esperion Therapeutics (ESPR), Glycomimetics (NASDAQ:GLYC), Akebia Therapeutics (NASDAQ:AKBA), Loxo Therapeutics (NASDAQ:LOXO), Portola Pharmaceuticals (PTLA), Sangamo Biosciences (SGMO), Abeona Therapeutics (ABEO), Kronos Worldwide (KRO), Kemet (KEM), Weight Watchers (WTW) and Chegg (CHGG). A balance sheet rollback should have a qualitatively similar impact as an interest rate hike - and doing both in close proximity, in our opinion, can have the economic impact of a double rate hike. This appears to be a riskier approach, particularly since it is not yet completely understood how quantitative de-easing may impact the economy, and what could be the unanticipated risks of a rollback. In addition, geo-strategic concerns, the economic impact from two major hurricanes, and fiscal paralysis are other important considerations that call for the Federal Reserve to tread lightly on the interest rate pedal at a time when it is removing quantitative easing. We believe signs of a restrained posture with regards to further interest rate increases this year will provide further momentum for stocks to move higher, as it diminishes the risk of a Federal Reserve induced slowdown. Even though there is the possibility of elevated risk for stocks during September and October, as detailed in the Partial Eclipse article, we believe a higher stock allocation for the remainder of the year remains justified at this time. The article was submitted on September 18 for publication on Seeking Alpha.